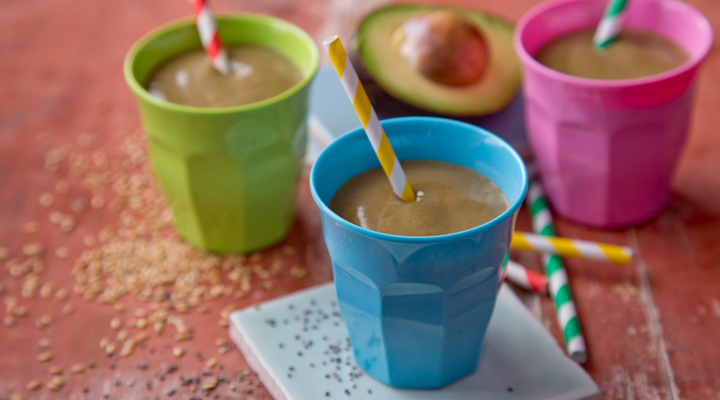 This smoothie tastes so good, you’d nearly think it was dessert, not breakfast! But it’s packed with loads of filling, healthy ingredients that will keep you going until lunchtime. 1. Start by placing the baby spinach in your blender and packing it down a bit. Spinach sneaks in some iron and yet your kids won’t even know it’s in there, as the sweetness of the bananas masks any ‘green’ flavour. 2. Add the bananas, cacao powder, oats, seeds, peanut butter and 300ml of the milk and blend for at least 30 seconds, until completely smooth. If it’s too thick, add a little more milk and blend again. Pour into two glasses and serve with a straw. 3. This can also be made the night before – pour the smoothie into an airtight container, then give it a good stir in the morning before pouring into glasses. Or do all your prep the night before and place the ingredients in a ziplock bag or airtight container in the fridge, ready to blitz together in the morning. Tip: As a twist, you could also make this into a chocolate peanut butter chia pudding by blending the smoothie (without the chia seeds) and pouring it into a large jar, then stirring in 3 tablespoons of whole chia seeds, covering the jar with a lid and letting it sit in the fridge overnight to thicken up.